In yesterday’s post I mentioned the reading challenge I’m doing this year (via Goodreads). Some people may consider 25 books in a year to be quite a lot. Others may think that it’s nothing. I must admit I’m leaning towards the latter viewpoint at the moment, but with the busy year ahead I thought I’d be a bit cautious. I’m off to a good start with the reading. Last night I finished Through the Language Glass, apparently being further through reading it than I had expected. In the spirit of challenges I thought I’d share with you my feelings about the book. I did write a brief review of it on Goodreads, but perhaps I’ll go into a bit more detail. I got this book when I was in England back in 2011 (which seems awfully long ago now, don’t you think?!) I can’t quite recall whether it was a birthday gift from my brother or if I bought it for myself. Either way, it caught my eye and ended up joining the many books I own. I’m not entirely certain why I didn’t start reading it sooner. I’d put it down to busy-ness, but I did find time to read other books since buying it. A few short months ago, not long after starting my university course, I spotted this book on my shelf. Considering that my nursing class is such a multi-cultural collection of individuals the intrigue of how different cultures viewed the world certainly caught my attention. When I first began reading the book I was in the bustling lobby of our faculty, waiting for a lecture to start. Not the most conducive setting to be reading anything, and as I soon found out some of the ideas in this book do require slightly more attention than the setting allowed for. I did dip in and out of the book once or twice in the following weeks, but had difficulty in finding time to give Through the Language Glass the attention it deserved. Luckily when the holidays came I did have the time; a couple of bus and plane journeys between Finland and England quickened my progress through the pages considerably, even with the occasional interruptions as an interested S read over my shoulder. And last night the hour or so of pre-sleep downtime was all I needed to finish off the book. 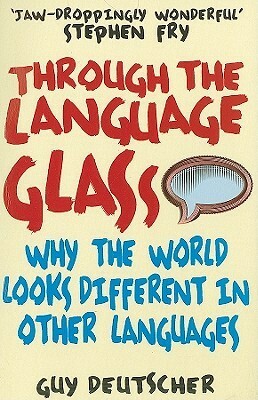 Through the Language Glass is a wonderful read. I may be being naive, but I would be surprised if any but the most studious linguists did not find something new to learn from this book. From the fascinating and inconsistent ways in which many languages apply gender to nouns, to the way in which speakers of Guugu Yimithirr had developed the ability to recognise North from South and East from West even when in an unfamiliar room with no points of reference – solely because of their use of these rather than egocentric co-ordinates in their daily language. The author, Guy Deutscher, delves into the heart of the matter looking back to when William Gladstone first proposed that different cultures see colours in different ways, based on his studies of Homer’s great works. Whilst Gladstone may have got his ideas a bit back-to-front that was more the result of the limited knowledge of the time than any fundamental flaw of Gladstone himself. As Deutscher points out whilst the ideas of long ago may seem embarrassingly ignorant with the increased enlightenment of the day, it’s more than likely that the ideas of modern times will look ridiculously outdated to the minds of the future – as he so aptly says ‘Forgive us our ignorance, as we forgive those who were ignorant before us’ pp 239. I think I’ll leave this impromptu review here. I’ll just finish by saying that, if you are even slightly interested in the power of words and language to affect the way we perceive the world.. well, this is definitely worth a read. I know I’m certainly going to be reading it again some time in the future. Have you read this book? Would you like to? What are your thoughts on the way each persons mother tongue influences their perception of the world around them?